Would you believe it?! We, the public, pay an estimated $3.5 billion per year for medicine because drug manufactures such as Merck pay other companies NOT to put generic drugs on the market. Sounds like a monopolistic practice to me! See <a href=”http://www.politico.com/story/2012/12/supreme-court-generic-drugs-pay-for-delay-84810.html?hp=r9>politico.com’s article on this subject</a> For general context, see Joseph Stiglitz’s book, The Price of Inequality. If you go to the link above, you can animate this image, seeing how the per country CO2 changes over the period 1820-2000. The area of the circle is proportional to the country’s annual CO2 emission per capita. Mouse over circle to see name of country. 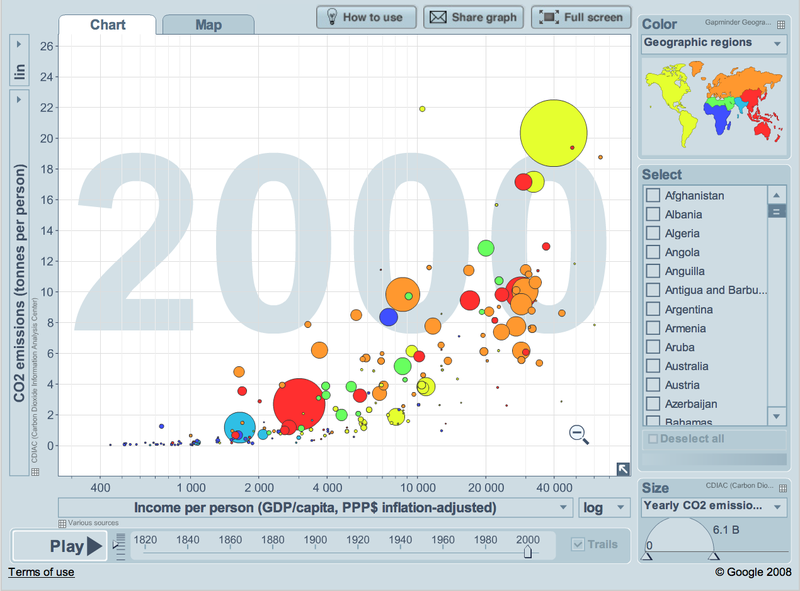 Gapminder.org has a wealth of great databases and visualizations thereof. Gapminder is a non-profit foundation based in Stockholm. Our goal is to replace devastating myths with a fact-based world view. Our method is to make data easy to understand. We are dedicated to innovate and spread new methods to make global development understandable, free of charge, without advertising. We want to let teachers, journalists and everyone else continue to freely use our tools, videos and presentations. Your contribution will help us in our efforts to explain how the world is changing. Your generosity will strengthen our independence. Help us achieve a fact-based understanding of the world. Support our work by making a donation today. PS. Gnashing of teeth, such as there may be any, will appear in What Would Eisenhower Do? Texas employment wasn’t down much at all in these years, as the state lost only 53,000 jobs. But looming behind that number are large losses in the private sector (down 178,000) and large gains (up 125,000) in government jobs.” Which shows, Bernstein goes on, that Texas has followed “a traditional Keynesian game plan: as the private sector contracts, turn to the public sector to temporarily make up part of the difference. For further political comment, see What Would Eisenwhower Do? The payroll tax cut is set to expire on January 1. One would think that Republicans would want to make the cut permanent, as with the Bush tax cuts. But one would be wrong. See this article in the Washington Post. Before you read the article you may wish to guess why expiration of one kind of tax cut is good but another is bad. Posted in: Politics. Tagged: ben bernanke, crazy, Rick Perry, traitor. It just gets crazier and crazier! But these are only the best-known of this crowd’s extreme views. In an unpublished interview, Gov. Rick Perry of Texas told Fortune magazine that if he had been president in 2008, he wouldn’t have engaged in the financial rescue effort. Without the bailout, initiated by the Bush administration, we would not have a functioning economy today..
Mr. Perry also wants to repeal the 16th Amendment, thereby eliminating the income tax, which accounts for 80 percent of government revenue. Like his fellow aspirants, Mr. Perry has offered no analysis to explain how the government would function under his vision. Mr. Paul, who finished second in the Iowa straw poll on Saturday, has for decades sought to abolish the Federal Reserve, arguing that it is corrupt and unconstitutional. Eliminating our central bank is a crazy idea that would plunge the country back into an oscillating 19th-century world of panics and busts. Rick Perry wants to do bad stuff to "traitor" Ben Bernanke. Can it get any crazier? Yes, I’m afraid it will. Can we talk about who is a traitor? Well, we can. But mark my words: those who throw stones, will act like crybabies if what they do to others is done unto them. Texas Governor Rick Perry, who entered the presidential campaign on Saturday, appeared to suggest a violent response would be warranted should Federal Reserve Chairman Ben Bernanke “print more money” between now and the election. Speaking just now in Iowa, Perry said, “If this guy prints more money between now and the election, I dunno what y’all would do to him in Iowa but we would treat him pretty ugly down in Texas. Printing more money to play politics at this particular time in American history is almost treasonous in my opinion.” Treason is a capital offense. See above link for Krugman’s comments on Governor Perry’s contribution to thoughtful and civil discourse. – Ian C. Shepherdson, chief United States economist for High Frequency Economics, a research firm, said in an interview.